25 Game Schedule Against The Prep School JV Teams, including Belmont Hill, Nobles, Cushing, St Sebastian’s, St Marks, Middlesex, Brooks, Phillips Andover, Pomfret, St Johns, St George’s, Groton, Pingree, Governor’s, Tabor, Lawrence Academy and more. The Elite player fee for the upcoming season will be $3,070 for full time skaters and $2,610 for full time goaltenders on full season teams from Squirt to Bantam Minor. This player fee includes two 80 minute practices per week, a 32 to 36 game (15 minute periods) league schedule, insurance, EHF League fees, USA Hockey Club Team fees, socks, and two preseason practices in the July/August timeframe. Comparable fees will apply for the other teams based upon their variation in ice use. Eastern Hockey Federation (EHF) has announced the structure for the EHF Selects (15/16U/18U divisions) which will begin play this Fall. The EHF Selects will be the new home to New England’s strongest fall season teams including: the Boston Jr. Eagles, Cape Cod Whalers, Mid Fairfield Jr Rangers and the Boston Jr. Bruins and others. EHF Selects will be made up of the EHF’s Elite organizations and former Mass Select League organizations top level team at the 15/16U/18U divisions. These teams will then be divided into two National Bound Tier 1 groups: Tier 1 Elite & Tier 1 which will be determined after the tryout period by the EHF Selects committee. The Tier I Elite division will be the top 15/16U/18U level in New England. The exact number of teams at each level will be determined by the EHF Selects committee. The divisions will be between 5 and 8 teams at each level. The quality of the teams in the Tier I Elite division will be similar to the top 4 teams in a EHF Elite youth level. Meaning these teams will all be top ranked in New England and among the top in the entire country in the myhockeyrankings.com rankings. This level will be a collection of New England’s top players competing against each other while providing unparalleled exposure to college coaches and NHL scouts. The Tier I division will be the remaining top teams from each organization. These teams will have the ability to compete for a league championship and a spot in their State or Regional play downs which is the first step on the path to USA Hockey’s National Championships in the spring. To even further strengthen the EHF Selects schedule, the league has partnered with the top fall showcase tournaments to ensure EHF Select teams will get priority matchup against nationally ranked teams from outside of New England in all these events. Through these partnerships the EHF Selects has been guaranteed that our teams games will take place during the most optimal time slots to maximize visibility to the college and pro scouting community. EHF Selects Columbus day Tournament: Boston area event at local college and university campuses such as BU, Harvard and Northeastern. Here are examples of organizations that have attended these fall showcase events in the past and whom the tournament directors expect will attend in the future: Selects Academy, Hill Academy, Chicago Fury, Virtua Hockey, Toronto Nationals, Oakland Jr Grizzlies, Toronto Marlboros, Honey Baked, Northwood School and the Notre Dame Hounds. Below is a tentative schedule for tournaments and league play for the Tier 1 Elite and Tier 1 divisions. To ensure high level games every weekend, Tier I Elite division teams will only play EHF Select teams and nationally ranked non New England based teams. Two former Minuteman Flames players, Noah Welch and Bobby Butler, will be playing on the U.S. Hockey team at the 2018 Winter Olympics in Pyeongchang, South Korea. It is an incredible honor and testament to their talent to be chosen to represent the United States at this most-notable, international event. 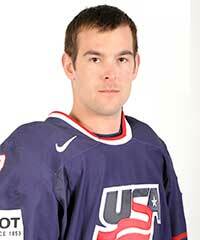 Noah Welch played for the Minuteman Flames in the late 1980s and is a veteran defenseman. From Brighton, MA, Noah attended Harvard University where he was captain of the hockey team and holds a degree in Government. In 2001, Noah was drafted by the Pittsburgh Penguins into the NHL, but he also played for the Florida Panthers, Tampa Bay Lightning, and Atlanta Thrashers. Currently, he plays for the Malmö Redhawks of the Swedish Hockey League. Hailing from Marlborough, MA, Bobby Butler played for the Minuteman Flames in the 1990s before attending the University of New Hampshire. A former member of the NHL’s Ottawa Senators, New Jersey Devils, Nashville Predators, and Florida Panthers, Bobby currently plays right wing for the Milwaukee Admirals of the American Hockey League (AHL). Among numerous awards, he notably won the 2011 Calder Cup championship while with the Binghamton Senators, bringing the trophy to New England Sports Center in his hometown where he played many games. 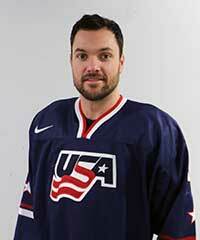 Additionally, Scott Young from Clinton, MA, will be an assistant coach for Team USA. He is a two-time Stanley Cup champion, winning in 1991 with the Pittsburgh Penguins and 1996 with the Colorado Avalanche. Currently, Scott is the Director of Player Development for the Pittsburgh Penguins and a member of the United States Hockey Hall of Fame. 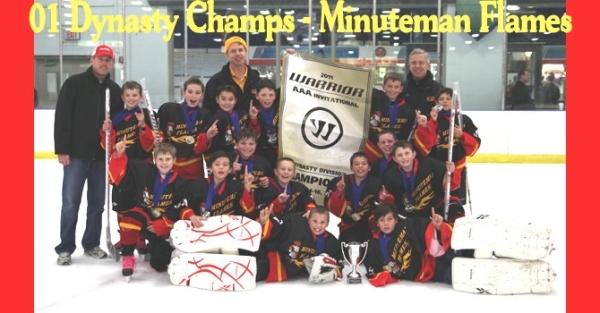 In the past, he has been a coach for the Minuteman Flames with his son being on one a team. The 2018 Games mark the first time since 1994 that active NHL players will not be on the roster, but Team USA will consist of deeply experienced players, including Brian Gionta who played 1,006 games in the NHL. Tony Granato, of the University of Wisconsin, will be head coach. At 6' 4" and 220 lbs., Noah Welch (#5) will be on defense; right-hander Bobby Butler (#15) will be a forward. U10 Major Lady Flames Are State Champions!! 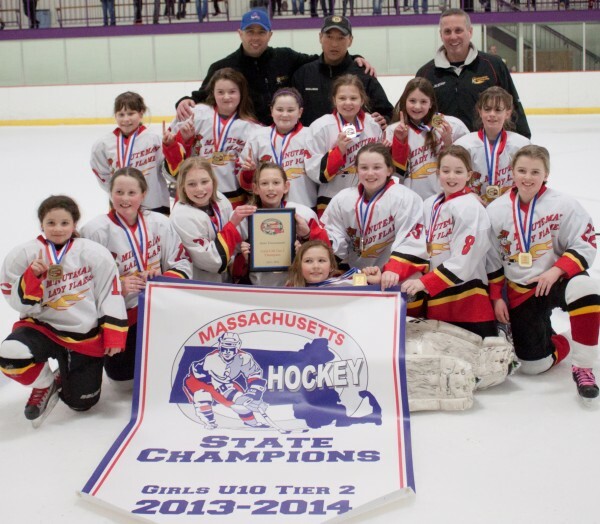 Congratulations to the U10 Major Lady Flames, the 2013-2014 Tier II State Champions! The team finished the regular season in first place in their division of the New England Girls Hockey League with a record of 22-4-4. They then faced the New England Jr Falcons (3-1 win), the Charles River Blazers (0-1 loss), and the MA Spitfires (5-1 Win) in state tournament round robin play, advancing to the semifinals. They defeated Assabet Valley in the semifinals. The girls then faced their toughest competitor, the Charles River Blazers, in the championship game, who had defeated the Flames in game two of the state tournament round robin. After an exciting and exhausting game, including four rounds of overtime, the Lady Flames scored to defeat the Blazers 3-2, and take the title State Championship Title. 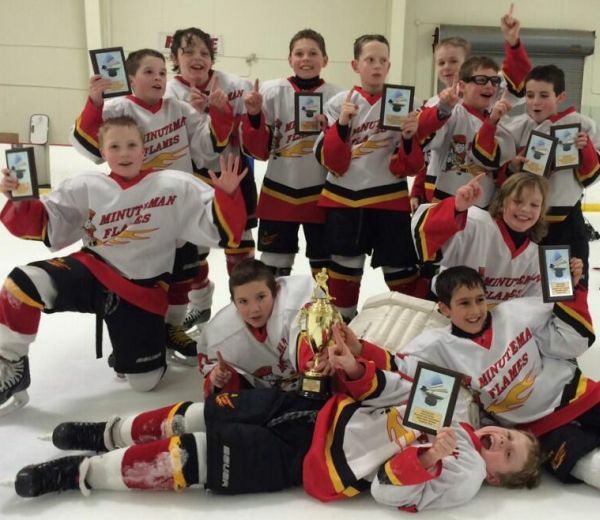 Congratulations to the 2004 Elite Minuteman Flames, who won their division in the Presidents Day Elite Invitational this past weekend at the New England Sports Center! The Flames played six games, going 5-1 and scoring thirty goals while allowing five. 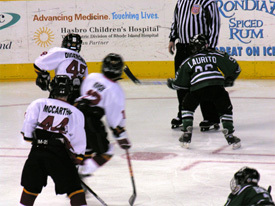 The Flames defeated the Philadelphia Junior Flyers in the semifinals, and the LA Junior Kings in the championship game. 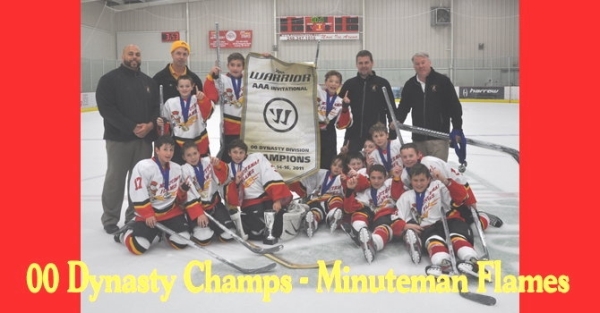 Minuteman Flames 2001 Elite Team traveled to Toronto in early November to face the top Canadian and US teams in the Shanahan Warrior Tournament, hosted by the Mississauga Reps Hockey Club. There were 45 teams participating, with the top 8 advancing to the playoffs. The Flames went a perfect 7-0, scoring 47 goals while only allowing 5, defeating #7 Mississauga 6-1 in the Quarterfinals, #8 Whitby Wildcats 7-1 in the Semifinals and the #3 ranked London Jr. Knights 3-0 in the Championship Game, a rematch of last year's Silver Sticks Final in Whitby. Tough scheduling had the team playing 5 games in a 24 hour period to earn the win! This tournament victory is the 10th championship in a row for the team, and their Pee Wee record is now a remarkable 105-0-7. The coaching staff credits committed team defense, unselfish and balanced offense, and great goaltending for the tournament win. MARLBORO, MA—Congratulations to the 2004 Elite Minuteman Flames, who swept their division in the EHF Columbus Day Elite Invitational this past weekend at the New England Sports Center! The Flames played six games, going 6-0 and scoring thirty goals while allowing seven. The Flames defeated the NJ Colonials, North Jersey Avalanche, and NJ Rockets in round robin play. 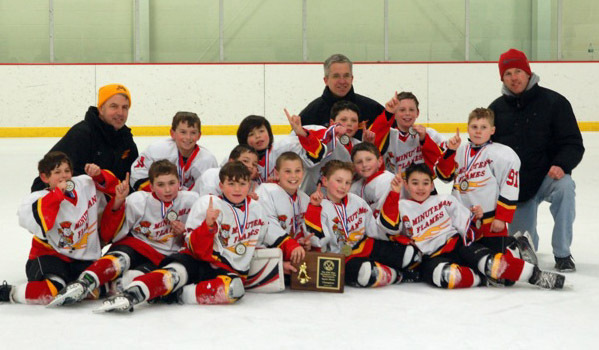 The Flames then swept the playoffs by defeating the Providence Capitals in the quarterfinals, the Islanders, (#3 in the US) in the semifinals, and the South Shore Kings (#4 in the US) in the championship game. MARLBORO, MA—Congratulations to the 2001 Elite Minuteman Flames for winning the EHF Columbus Day Elite Invitational this past weekend at the New England Sports Center! The Flames played six games, going 6-0 and scoring thirty-three goals while allowing six. The Flames beat the Philadelphia Jr. Flyers, Team Comcast, and Mercer Chiefs in the round robin, before facing some of the best competition in the country in the playoff round. 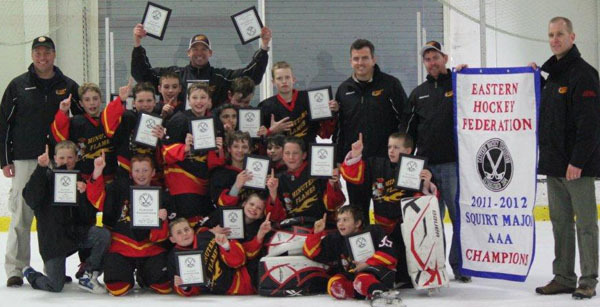 The Flames advanced in the playoffs by defeating the South Shore Kings (#18 in the US), Chicago Mission (#6 in the US) in a three-overtime thriller, and finally the Mid-Fairfield Yankees (#7 in the US) in the championship game. 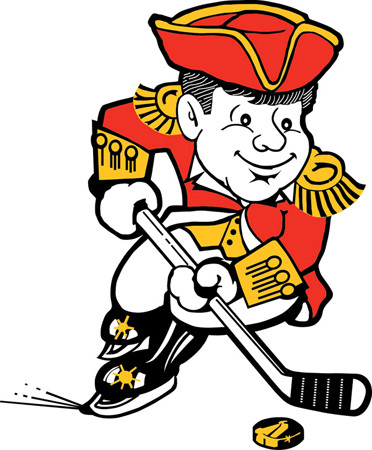 MARLBORO, MA--The Minuteman Flames, one of the premier youth hockey organizations in the country, and the Junior Bruins, one of the premier midget/junior hockey organizations in the country, are proud to announce a formal relationship at the Bantam Major full season level that will commence with the 2013-2014 season. 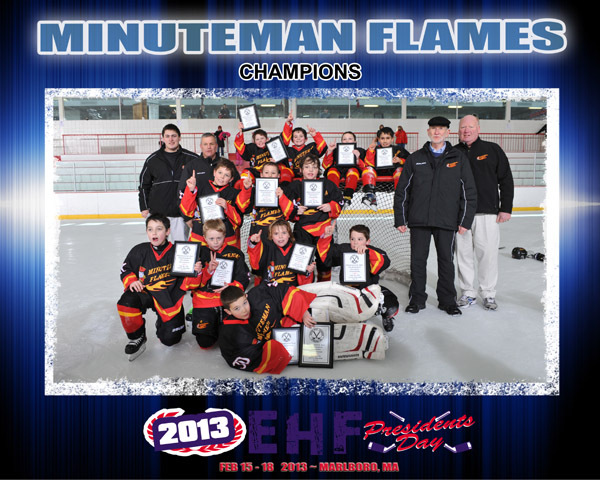 MARLBORO, MA—The Minuteman Flames 2004 Elites capped a great season by winning the 2013 EHF Playoff Championships. The team went 5-0 in the playoffs, scoring 26 goals while allowing only 11. They defeated the Islanders ’04 Elites, 3-2, in the championship game after winning over the South Shore Kings Elites, 4-2, in the semifinals, both great contests. The Flames ’04 Elites also finished first in EHF league play, posting a record of 31-3-3 with a goals differential of 119; and posted an overall record of 59-7-6, with a goals differential of 255. 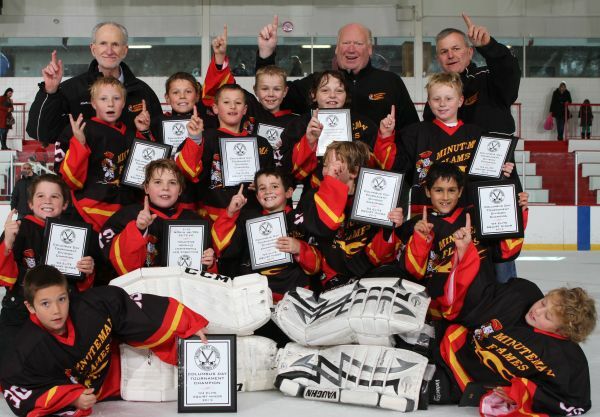 In tournament play, the ’04 Elites were champions in the 2012 Columbus Day Classic Tournament, 2012 North American Fall Championships, and the 2013 EHF President’s Day Tournament. 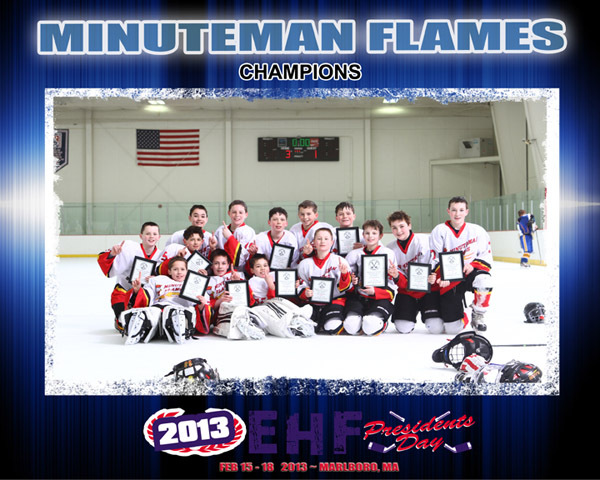 MARLBORO, MA—The Minuteman Flames 2000 Elites won the 2013 EHF Championships, defeating the Boston Bandits 1-0 in a thrilling championship game. The team went 5-0 in the playoffs, scoring 27 goals, and giving up only 7. 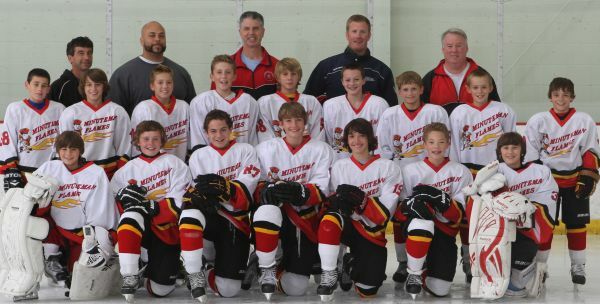 The2000 Elite Flames posted a 41-1-2 record overall in the league with a goal differential of 204. 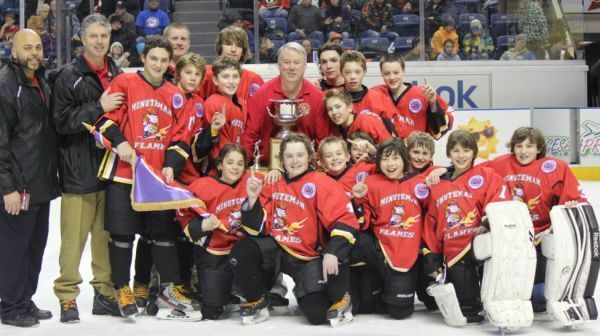 The 2000 Elite Flames also won the prestigious 2013 Quebec Peewee Tournament in February, becoming only the 2nd New England area team in 54 years to win the exalted ‘Q’. Their amazing accomplishments against some of the best 2000 teams in the world are described in a companion article on this website. Congratulations to Coach Richard Gallant and the 2000 Elite Flames players and their parents for a remarkable finish to an even more remarkable season! 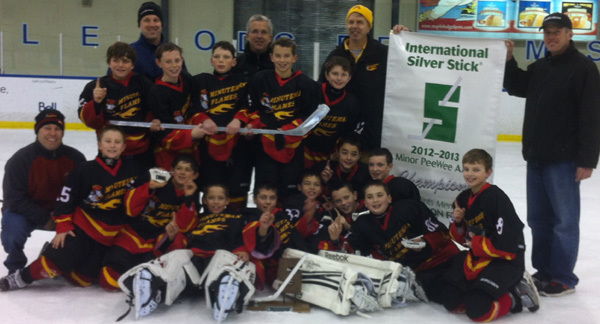 MARLBORO, MA—Congratulations to the Minuteman Flames 2005 Elites for winning the 2013 EHF Playoff Championships. They defeated the Islanders, 7-5, in the semifinals, and capped that with a 6-3 win over the Providence Capitals in the Championship game. The Flames went 4-1 overall in the playoffs, scoring 30 goals, while giving up 18. The Flames finished the regular season ranked third, and posted a 19-7-2 record overall with a goal differential of 68. Congratulations to the 2005 Elite players, coaches and parents on a great season! MARLBORO, MA--The Minuteman Flames are pleased to announce that Chris Delaney will take over as Head Coach for the 2000 Elite team starting in Fall of 2013. Currently an Assistant Coach with the '99 AAA Flames and Head Coach for Hopkinton Middle School, Chris brings a love for the game and an enthusiasm for development that will serve his squad well. MARLBORO, MA--The Minuteman Flames are happy to announce that Keith Hughes will be the Head Coach for the newly formed Minuteman Flames Bantam Major/14U Team for the 2013-14 Season. Keith is currently an Assistant Coach for the #1 nationally ranked '01 Elite Flames, and will bring a wealth of coaching experience to his new post. Congratulations to Minuteman Flames alumni Cal Burke, who recently committed to Notre Dame. 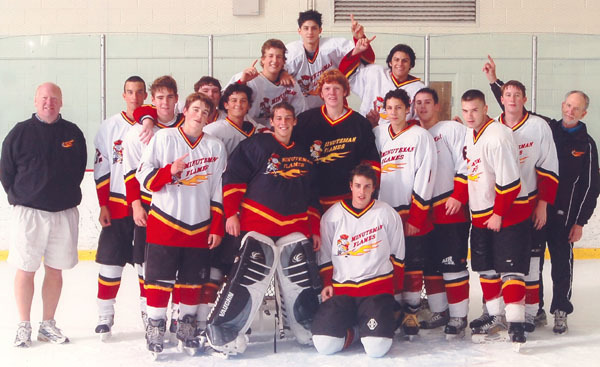 Cal is presently attending Nobles and Greenough, and was a key player on the 1997 Minuteman Flames Elite Team throughout his youth hockey career. We wish Cal the best with the Fighting Irish. 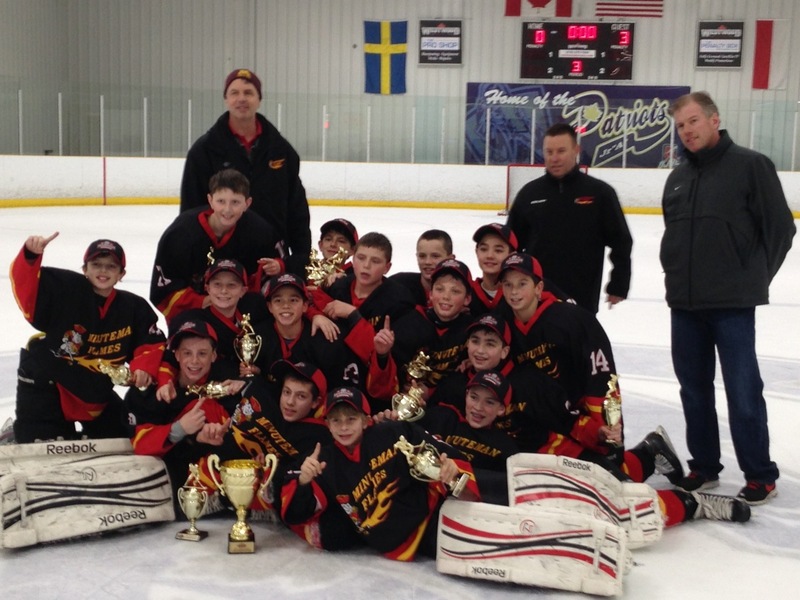 Congratulations to the 2001 Flames for winning the Peewee Minor Division of the 2013 EHF President’s Day Tournament, defeating the Mid-Fairfield Yankees in a 3-1 thriller. The team went 6-0-0 in the tournament, knocking off the 13th, 12th, 11th, 8th, and 6th ranked teams in the country to do so. In 6 games the team scored a total of 25 goals for, and allowed only 5 against. 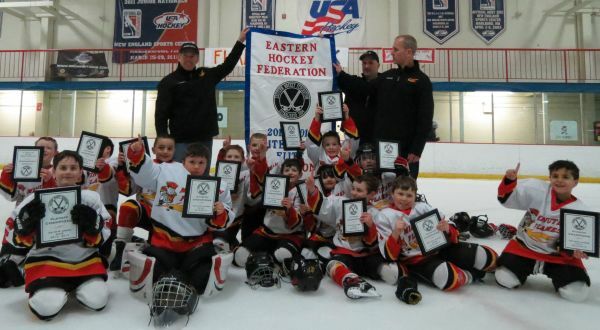 Congratulations to the 2004 Flames for winning the Mite Major Division of the 2013 EHF President’s Day Tournament, defeating the Mid-Fairfield Yankees 2-0 in a hard fought game. The team went 5-1-0 in the tournament, with impressive wins against some of the top teams from the east coast. In 6 games, the Flames scored 31 goals for, and allowed only 5 goals against. 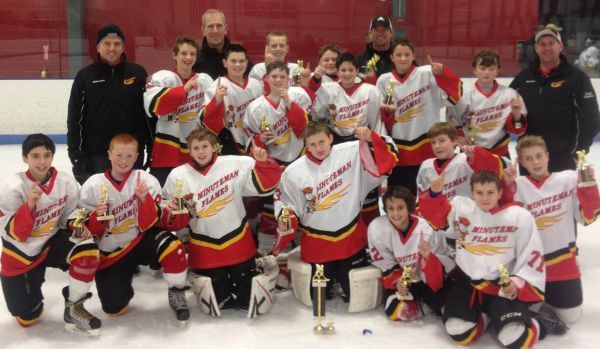 Congratulations to the Flames 2001 AAA Division 1 Gold team for winning the Cyclones MLK Classic. They won all 4 games, scoring 27 goals and allowing only 5! Congratulations to the Flames 2001 Elite Team on a great run at the Whitby Silver Sticks Finals Tournament. They came out on top, defeating the Mississauga Reps, 3-1, in the quarterfinals; the Detroit Little Caesars, 2-0, in the Semifinals; and the London Jr. Knights, 4-1, in the Championships. Team pictured with the "Flames Fanatics" (siblings). 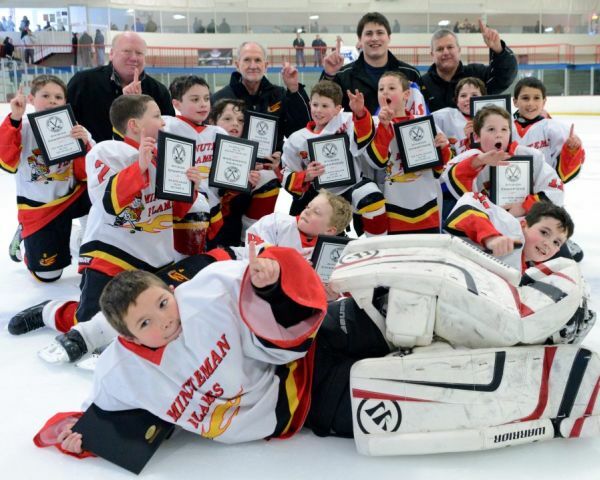 Players from the Minuteman Flames 2001 AAA Hockey Team are taking some time off the ice to participate in the upcoming One Mission Kid's Cancer Buzz-Off, an event to raise money for children and their families fighting pediatric cancer. The talented group of 11-year-olds, who also won the 2012 EHF AAA Championship in March, will travel to Gillette Stadium on Sunday, June 3 to shave their heads and donate to the Locks of Love charity. The select group from the Eastern Hockey Federation is led by head coach and former NHL San Jose Shark's player Kevin Sullivan, Team Manager Peter Boyd, and assistant coaches Paul Carpenter, Dave Sloan and Brian Jefferies. 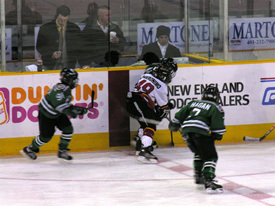 They play teams across Massachusetts including Boston and Springfield, Connecticut and as far as Toronto, Canada. "It's a huge commitment," Assistant Coach Paul Carpenter of Auburn said. Typically, from September to March, players practice for 90 minutes, twice a week at the New England Sports Center in Marlborough in addition to weekend games and hockey clinics. According to Team Manager Peter Boyd of Auburn, the team, coaches and management decided the Cancer Buzz Off would be a great way to teach the boys a valuable lesson during the off-season. "This supports pediatric cancer. We thought the kids could relate to that - supporting other children," Boyd said. "We've had families on our team directly affected by cancer. So this means a lot to these families. The kids have really stepped up - there has been no complaining." Since April, the team has raised over $6,000 in donations. The young players have also dug deep into their own pockets to contribute including Boyd's son, Jack, who donated $100 from his own personal savings. According to Boyd, this is the first year the team has participated in the Kid's Cancer Buzz Off, but hopefully not the last. "We only had a month to fundraise but we're trying to find something that we can support every year," Boyd said. "We have a great group of people. It starts with the head coach and his philosophy - teaching the boys to become men on the ice but also off the ice. That has been a tone set from day one." Anyone who would like to donate to the One Mission Kid's Cancer Buzz-Off, should visit The Flames 2001 Fundraising page. All proceeds will benefit Children's Hospital Boston and the vital programs and services they provide to help kids beat cancer. Team players include Jack Boyd and Cam Carpenter of Auburn; Danny Holloway of Shrewsbury; Vinny Pascale and Casey Sullivan of Westborough; Matt Mahan of Worcester; Tim Farley of Paxton; Jack Sloan, Bobby Petracca and Luke Glidden of Hopkinton; Jackson Hornung of Ashland; Tyler Wilson of Hamden; Colby Doiron of Leominster; Kevin Kelly of Holliston; Ethan Thorpe of Woodstock CT; Alex Jefferies of Lunenburg. the Columbus Day Classic 2011! 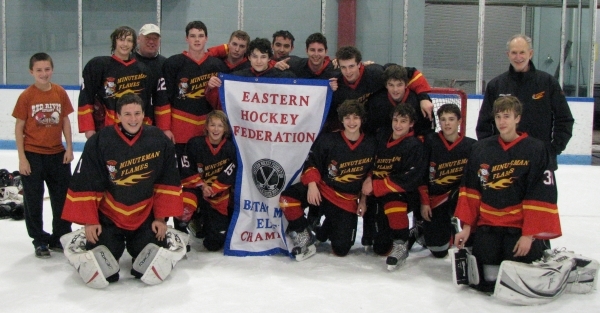 Congratulations to the Bantam Major Elite EHF Champions! 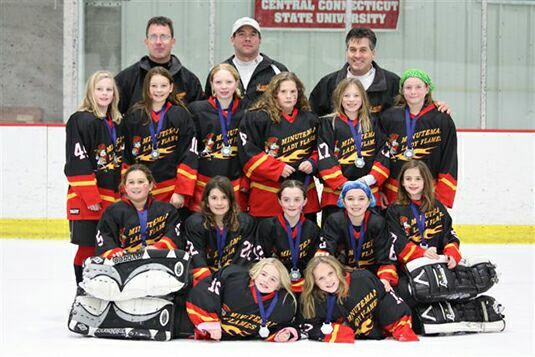 Congratulations to the U10 Minuteman Lady Flames for a fine showing at the prestigious Polar Bear Tournament, held December 2008 in Connecticut. The team earned a 2nd place finish. Midget Minor Team For A Great 2007 Season! 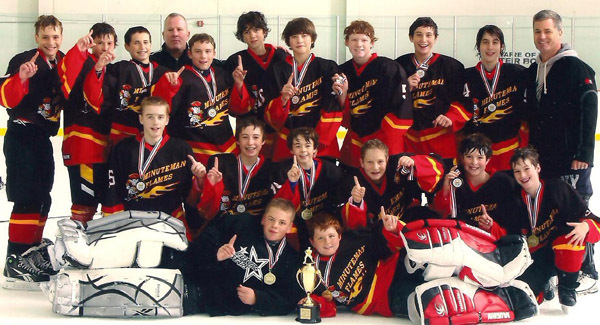 They Won The 2007 EHF Midget Minor AAA Championships, With a 8-2-2 Season, Defeating The Bridgewater Bandits Black, 4-0, In The Semifinals, and the Bay State Sharks, 5-1, In The Championship Game. The team is: Joe Ackil (15), Andrew Arbour (25), Tyler Byrne (12), Dan Caliendo (10), Pat Coates (30), Brenton Croteau (3), Steven Iacaboni (22), Max Kruse (8), Ryan Levesque (61), Sean O'Keefe (7), Cam Roberts (9), Greg Silverman (3), Cody Smith (18), Devin Smith (9), Chase Williams (20). 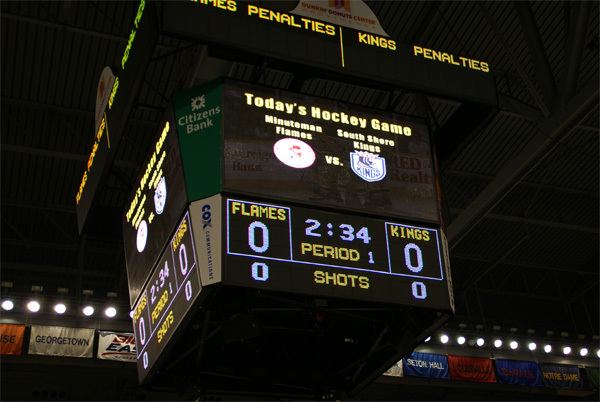 The 96 Flames and Kings had the great pleasure of playing their league game in a professional manner at the Dunkin Donuts Center hosted by the Providence Bruins before the Providence Bruins Game on Sunday, February 18. 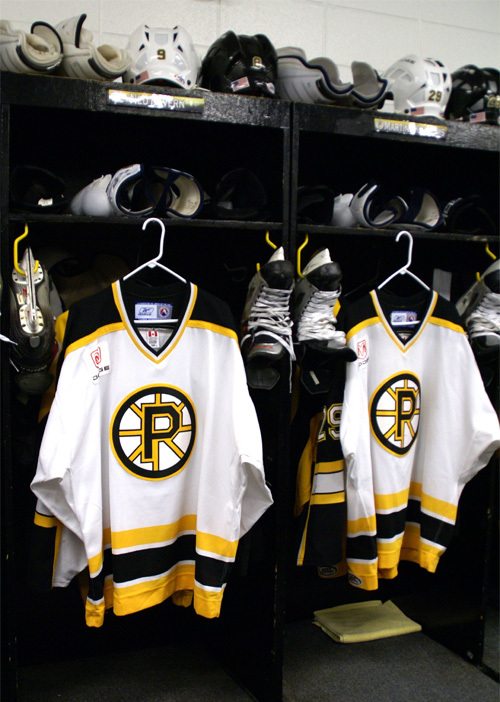 The teams were greeted at the Dunkin Donuts Center by the Providence Bruins Staff and escorted to their locker rooms deep in the vintage facility, both reminiscent of the Colisee in Quebec City and surprisingly modern due to the $62 Million Dollar refurbishment underway. The fans were escorted to the stands, and were greeted by the DD Center’s new video scoreboard and audio system, where they would be able to watch the game, replays and special effects just like the Providence Bruins – Hartford Wolf Pack AHL Game that would follow. After warm-ups, player introductions, and the national anthem, the game was played, with the scoring, penalties announcements and music of a regular NHL/AHL game. Some of the players were able to get autographs on their P-Bruins hats, and a look at the P-Bruins locker Room. The locker on the left is Ned Havern’s, a 2002 NHL draft choice that was on the 82 Minutemen Flames Team coming up. After the game, the teams and their fans were able to grab a bite to eat in the DD Center while watching the 8,600 Bruins and Wolf Pack fans join them to watch their AHL game... All in all, a great day of hockey. 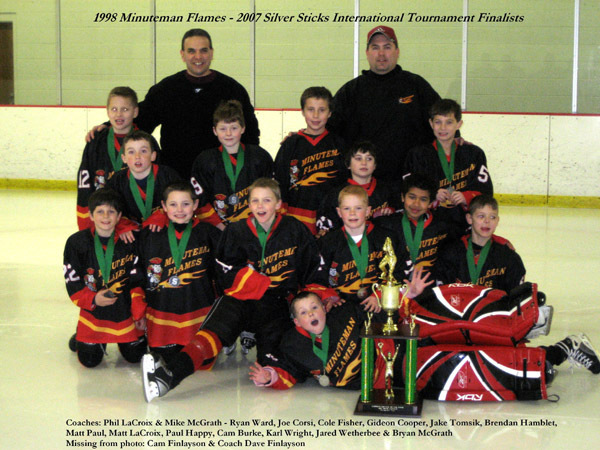 The 1998 Minuteman Flames Mite Major team, after winning the West Chester, PA Silver Sticks Regional Tournament in November, reached the finals of the International Silver Sticks Tournament held January 26 – 28 in St. Clair Shores, MI. In advancing to the finals, the Flames went 3-0 in their preliminary bracket: A 5-2 win over the Caledon Hawks (Toronto), an 8-1 win against the North Pittsburgh Wildcats and a hard fought 3-1 victory over the Kensington Valley Rebels (Detroit) who had also entered the final preliminary bracket game at 2-0 and holding all tie breakers over the Flames. The semi finals were comprised of the four bracket winners. In the semi’s the Flames faced the Suffolk P.A.L. Silver Shields (NY) (2-0-1 bracket winner) and came away with a 4-0 win setting up a final game match up with the Chesterfield Falcons (MO) (3-0 bracket winner) and 10-0 semi-final winners over the Markham Waxers (Toronto). The Falcons entered the final game with a total goal differential of 43 GF and 4 GA with the Flames at 20 GF and 4 GA. In the finals Chesterfield raced out to a 3-1 lead through two periods, but the Flames mounted a furious third period attack falling just short in a 4-2 Falcons victory. 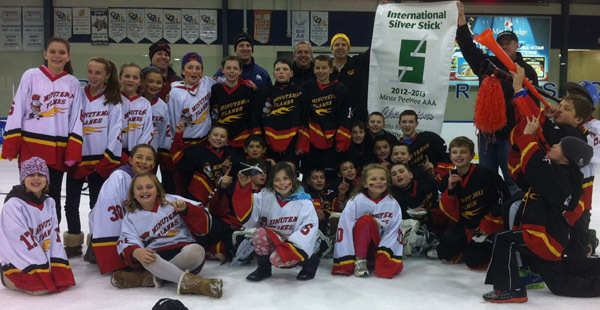 By reaching the finals the Flames received an automatic bid to play in the 2008 International Silver Sticks Tournament in Whitby, Ontario. Congratulations to the entire 1998 Minuteman Flames team on an outstanding Silver Sticks Tournament: Brendan Hamblet, Gideon Cooper, Cam Burke, Cam Finlayson, Matt Paul, Jake Tomsik, Karl Wright, Joe Corsi, Matt LaCroix, Paul Happy, Jared Wetherbee, Cole Fisher, Ryan Ward & Bryan McGrath - voted Championship Game Most Outstanding Player.